Sam Martin has been the top Montgomery County 1600-meter runner in the Class of 2011 since his freshman year with a gradual progression of 4:43 to 4:28 to 4:21. 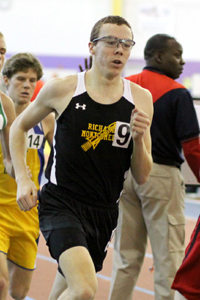 After a cross country season in which he finished fifth in the county and fifth in the state, he opened up this indoor season with a 2:35 1000-meter race and 4:23.65 fourth place finish in the Montgomery Invitational Mile. In this interview, he gives us a view into the Richard Montgomery track program and how he believes he has developed as an athlete over the years. He reveals his favorite events, favorite shoes, and even his favorite opponent. MoCoRunning: RM has come out running hard early this indoor season. Did you guys train straight through after cross country or did you get a break? What are your goals this indoor season and also for the outdoor season? Martin: We got a little break (only about one school week), but it is nothing new since we didn't get a break between indoor and outdoor last year. I have both team and individual goals this year. Indoor, I want redemption at Nationals after what happened last year. I also want to win some titles this year. I don't care whether it's 4x800, 1600, or 800. I'd like to win all of them, but I know how difficult that would be. I don't know yet which ones I'll concentrate on. The last and probably farthest reaching goal is to go after the team title indoor. I think that we have the team to compete for the title because we have people who can score high in multiple events. Outdoor is a different animal. My biggest goal is to walk away from states with 3 titles in the 4x800, 1600, and 800. Our 4x8 also needs redemption at the Penn Relays and we are aiming for a spot on the line for the Championship of America. I also hope to get into one or two really elite mile races, of which Penn is one. If I stay healthy and if I run the times necessary to qualify, I would like to get a shot at the Jim Ryun Dream Mile in NYC in June. I know that it is a long shot, but I've always dreamed big. MoCoRunning: What happened at indoor nationals and Penn Relays last year that you feel you need redemption? Martin: We had very high expectations for both of those meets and we expected to be somewhat in contention for a top 5 spot at least, especially at Nationals and in our heat at Penn. We had planned to perform better at Penn, but some issues quickly dashed those plans. We don't want to be seen as the team that gets to the big meets and then "chokes." MoCoRunning: What's the difference in training between June-November and December-May? What kind of mileage and intervals are you running during different parts of the year? Martin: June to November is all about building up base and strength. December to May is about getting as much out of my base as I can, but throwing in some speed as well. The workouts get shorter and sometimes more intense as the year goes on. My mileage is not as high as some other people's, but it suits me just fine. I probably max out at about 60 miles during the summer and that number drops to about 40 during the XC season. During indoor track, it doesn't really get above 30 and that number drops in outdoor. The intervals go from 600m to a mile in XC to 400-800 in Indoor and 600 down to 200. There are some days that we go out of that range, but it is all part of the program and it all means something. MoCoRunning: What is the hardest workout you have ever done? Martin: We've done many tough workouts throughout my four years, but the one that will stick in my mind for a long time is the 20x400 workout we did my freshman year. Davy broke it up into 4 sets of five, where we got progressively faster and progressively less rest each set. For example, we might do the 400 in 85 with 3 minutes rest one set. Then the next set we'd do the 400 in 80 with 2 minutes and 30 seconds rest. Keep in mind that I was a freshman, so these times were tough, even though they might seem slow. I remember that I hit the goal time or was within a second of it each time. My legs hurting after 10 and were burning after 15. The last set was brutal because I got up to the speed that I needed, but I couldn't make my legs go any faster. The last 400 came and we gave it everything we had. As we are coming up the home straight, Davy walks over to my dad and says, "Watch this." We finish and many of us just lie on the track. After about 30 seconds Davy says, "Alright, everybody on the line. We've got one more." We were like, "WHAT?!" We got on the line and did another one as hard as we could and after the 21st 400 we were done. I don't think my legs have been as shot after a workout as they were that day. This workout is one of my favorites! MoCoRunning: Coaches Scott Spear, Matt Wheeler, and Davy Rogers usually seem pretty relaxed on race day. Are they always like that or do they get fired up and kick your butts every once in a while? Martin: You think they're relaxed? I guess you didn't see Davy and Coach Wheeler at the Indoor 4A West Regional Championships last year during the 800. The coaches are pretty relaxed in between events or races, but they want to win. All of them are really competitive about anything from phone apps to throwing a football into a trash can from 30 yards away over a tree. You name it; they have a competition for it. Davy and Spear get us fired up before big XC meets and the same happens before big track meets. Their relaxation is just a cover for the fire they have inside. They are very passionate about what they do. All of them get really into our races and it really helps me and many others push themselves harder. I really feed off the energy of the crowd and if the crowd is fired up, I will usually run faster. MoCoRunning: Name one teammate or former teammate and one opponent or former opponent that you give credit for helping you develop as a runner and competitor. Explain how they helped you. Martin: Without a doubt the teammate is Jacob Cantor. This year is the sixth year that we've raced together and we always push each other to faster times and cause our coaches to cheer for one, then the other and pit us against each other. It has made us good friends and hopefully we will stay good friends for a long time. The former opponent who has helped me develop the most as a runner and competitor is Sean O'Leary. I was chasing Sean for the better part of the last two years. He always had me in XC, but I always wanted to beat him on the track. I was fortunate enough to do it a couple times, but he was always a little bit ahead of me when we raced under the same conditions. Having him beat me as often as he did fueled my competitive fire more than I know. He was also kind enough to talk with me when I was an underclassman trying to get to his level and now I turn around and talk with people that say hey to me or ask me questions no matter who they are. Thank you, Sean. MoCoRunning: RM had dominant track teams in 2006 and 2007, but bottomed out in the 2008 spring season, scoring zero points at the county championship. The football team still has a terrible record, but the track team has charged back to the top (second place at 2010 county championship). What have you and the coaches done to rebuild the team since your freshman year? Martin: I don't know what we've done to get the resurgence, but I think it is because we have people who hear us talk about it and either say "That might be fun" (the small minority), "I could do that to stay in shape for another sport" (Majority), or "I just want to win something." The sprinters that came out last year had played on the football team and really wanted to taste success before leaving for college. That made them hungry and the coaches fed that hunger and got the best out of all of them. Our coaches are great. They work with what the have and get the best out of many of the athletes. Personally, I just tell people what fun it is and that if you like indoor, you'll like outdoor and that means they probably will stick with the program. We haven't had one or two dominant athletes like some teams do, but we've had a solid core group and that can cover a lot of events. That led to us putting athletes in at least 10 different events at states. I believe that we will continue to have that kind of success in the future, though maybe not in the same way. We just keep producing good athletes and having good athletes come in to replace the ones that leave. It's just the natural cycle of high school sports. MoCoRunning: How have you matured as a runner since your freshman year? Martin: It has been a slow and ongoing process. I have become a better racer than I was in my freshman year and it's not because I am faster now. I race smarter and actually have a strategy to go off of in some races. I have made some pretty stupid mistakes (i.e. False start at outdoor counties last year) when I had a big opportunity, but I don't let those opportunities slip by me anymore. I know when it is time to take things easy and when to go after it. I used to go really hard on my warm-ups before practice, but I have become more relaxed on those and I remember to take my easy days easy. Now, I do the little things that I did not do when I was a freshman, like drink plenty of water during the day, lift weights, and ice or roll out sore spots. I understand the "why" behind the workouts now much better than I did as a freshman. MoCoRunning: What is your favorite event and why? Martin: Can I have two? I can't choose between the 1600 and the 800. The mile is great because you need speed, strength, and strategy to win and you need to be mentally strong as well to keep your mind on the race for just over 4 minutes. The 800 is great because you don't have to think as much during the race because it is so short! I can go as hard as I can for as long as I can and still have a kick left. The 800 is brutal, but fun! I'm crazy like that. MoCoRunning: Are you a shoe guy? Do you like to test out a lot of models of spikes and trainers or do you stick to one or two that work? Martin: I wouldn't say that I'm a shoe guy, though my mother might disagree with me. I have used the same brand and model of trainer since 7th grade and I do not think I will change in the future. I have used different models of spikes throughout my high school career from Asics to Brooks to Saucony to Nike. I really like the Nike Victory spikes and I joined that group this year. I kind of feel bad doing that because they are kind of like a fad, but they are so good. Until last year, no one on our team had them. Then Jacob Cantor went and got a pair and over the summer, I did, too. It might seem like I copied Jacob, but I didn't. I wouldn't have gone with them if they didn't feel right. MoCoRunning: What about those rec specs? Those must give you some serious speed. How much time do you drop because of them? Martin: Hahaha! At least I can see out of them. Actually, they're the same pair that I wore during cross country. They are sunglasses that have interchangeable lenses and a prescription insert. I got them last year for track because I wanted to be able to see when I was racing, but I did not want to wear my regular glasses in case they fell off and got broken. They made their debut at outdoor states last year in the 4x800 and in the 800, albeit without the insert (the lenses were being fitted) and with two different lenses. I don't think they directly influence my times, but they do allow me to see who I'm going after better. I don't think we would have won the DMR at Sportsplex Relays this year if I hadn't been able to see the Georgetown Prep anchor as well as I did with the glasses. MoCoRunning: How bad is your vision? Martin: My vision is pretty bad. I don't know the numbers behind it, but I can't drive without my glasses and most things look like a big haze when I don't wear them. MoCoRunning: Who are you related to? Tom Martin from WJ, Steve Martin, or Ricky Martin? Martin: Hahahaha! As far as I know, none of the above. Though I remember that when Coach Rogers from WJ introduced me to Coach Martin my freshman year, Coach Martin told me that he had a son named Sam. Congratulations Sam for developing into the runner that you are now. Without a doubt you have a very bright future coming up in the coming seasons and in college. Best of luck getting your goals done, it wold be SICK to see you run at the Jim Ryun Dream Mile. Sam, good luck. Your coaches are lucky to have a runner as dedicated as you. It's fun to coach runners like that.